We are partnering with Bright Yellow Creamery to offer customers premium ice cream. Between 8/1/17 to 8/11/17 if you receive a package – or you just want some ice cream – text (215) 908-6244 to request to buy pints of this delicious frozen treat. To find out the flavors of ice cream we are offering click here. All orders must be placed by 8/11 and each pint is $8 (the same amount that you’d pay if you purchased directly from them) and we’ll charge the credit card that we have on file for you when we deliver. If we deliver the ice cream as part of a delivery, there is no additional delivery charge. If you just want the ice cream delivered, there will be an additional $5 delivery fee. You can also come to our store to pick up the ice cream for free if you’re in the neighborhood. WHAT’S ONE THING THAT SURPRISED YOU ABOUT THE ICE CREAM BUSINESS? I was surprised by how much people truly cared about what's in their ice cream. It’s something I always cared about as a consumer and lover of ice cream, but starting this business has really proven that there’s a demand for a more natural offering. Many customer will come up to our cart asking about the ingredients and whether I make the ice cream myself. As a company we are very open about and proud of our process, and we’re glad to tell them anything about the ice cream. WHAT ARE THE ORIGINAL FLAVORS OF BRIGHT YELLOW CREAMERY? From the start I knew I wanted to sell classics like Vanilla and Chocolate because those are my personal favorites and everyone’s go-to flavors. I wanted to start simple, and focus on creating a pure product that spoke for itself. Soon after, I started experimenting with our ginger and lemongrass flavor, a combination inspired by a trip I took to Indonesia. WHICH FLAVORS ARE YOUR MOST POPULAR? By far my most popular flavors are Madagascar Vanilla and Dark Chocolate. These are the flavors everyone is familiar with and we aim to make them as premium as possible. If people are willing to be more creative, Sea Salt Honey is a popular choice. ARE THERE ANY NEW FLAVORS COMING OUT? We just recently finished our seasonal, peach flavor, since they’ve just come in season and there are so many local orchards we can source from. In order to develop the flavor we started working with different spices and greens until we found a combination we loved. We've experimented with our locally-sourced peaches by caramelizing them in maple syrup, cinnamon, brown sugar, and honey – and are excited to finalize this summer inspired flavor in just a few days. Are there any changes coming to the companY? 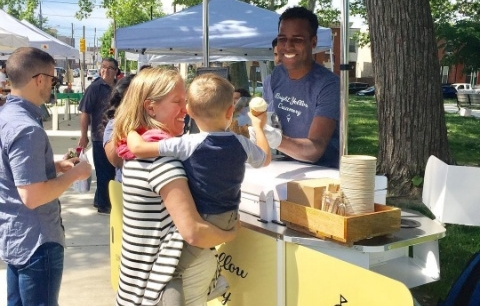 Right now we sell our ice cream online and at Farmers' Markets throughout the city, but we are planning on expanding fast in the next 12 months. In order to meet our needs, we have looked at different retail spaces around Philly, hoping to open a store next year. We also hope to be in local and boutique grocery stores in the coming months, in an effort to get our our ice cream to reach as many mouths as possible. Do you want some ice cream for yourself? Feel free to order with us at (215) 908-6244 or get it for yourself in person at Bright Yellow Creamery’s stand. Below, the hours of operation and locations for Bright Yellow Creamery are listed. We hope you like the ice cream has much as we do, over at Fishbox! If you would like to know more about Bright Yellow Creamery you can follow them on Facebook or Instagram.